Mickey 9's Story . . .
Mickey is an 7-month old bundle of energy. 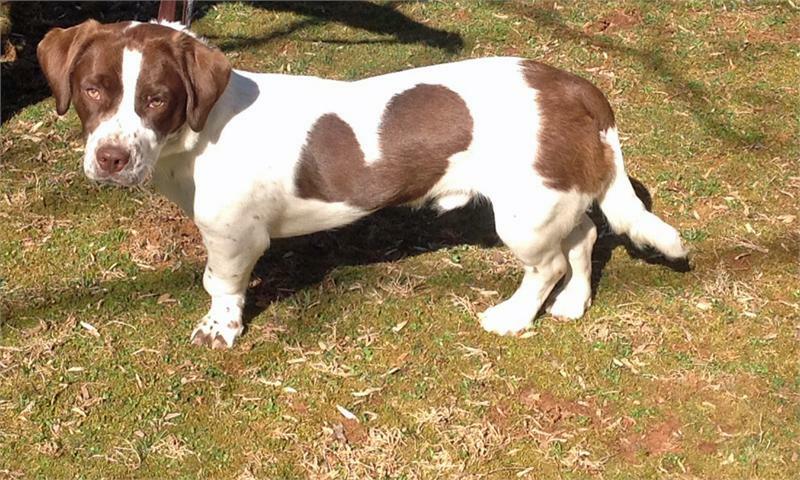 He is a liver and white Springer mix with the beautiful markings of a Springer and the shorter legs of his Corgi relative. 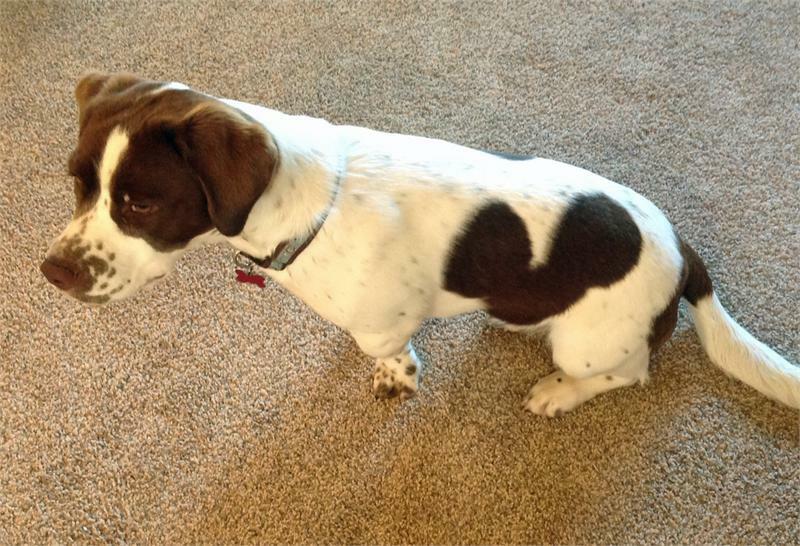 He has a distinctive brown Mickey Mouse silhouette on his body and light brown eyes rimmed in a darker brown. What a handsome guy! 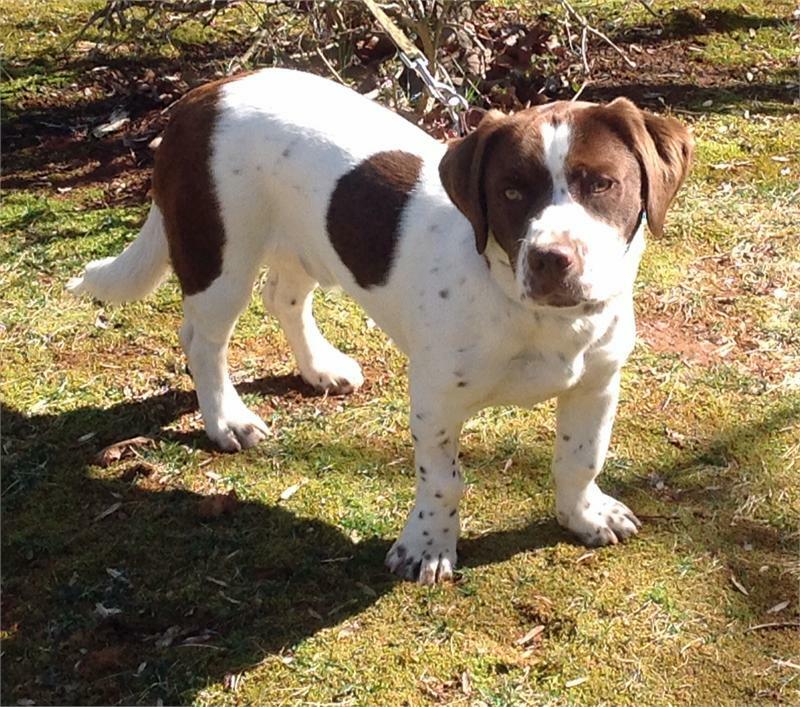 Mickey came into MAESSR when his North Carolina owners found themselves unable to devote the time and attention needed to get a puppy started on the right track. This playful fellow has the typical Springer personality--he's affectionate, gives lots of puppy kisses, loves to be near his people, enjoys a good belly rub, and likes to cuddle. He thinks just about any activity is an opportunity for a game! Fetch and tug-of-war are his two favorites at the moment. 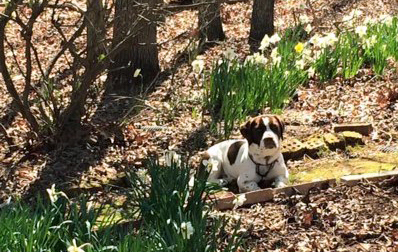 As a pup, Mickey is still learning all about living in harmony with his environment. He knows the "sit" command. He doesn't resource guard his food or treats, and isn't much of a counter-surfing threat due to his short legs. He does jump up on people but will get down when directed. He's still in the process of becoming fully housetrained and does have the occasional accident in the house. Handsome does pretty well on the leash and loves, loves, loves to take walks. He reacts appropriately to dogs he meets while out and about. He was a little nervous on a socialization visit to the pet store, but handled it well. At home he has full run of the house when his foster mom is there, and is crated when he's left alone. At night he sleeps without complaint in a crate in the foster mom's room. The checkup at the vet was passed with flying colors. Mickey was relaxed during the vet's exams and didn't mind having his ears and paws handled. He is up to date on all his vaccinations and has been restarted with heartworm and flea/tick medications. 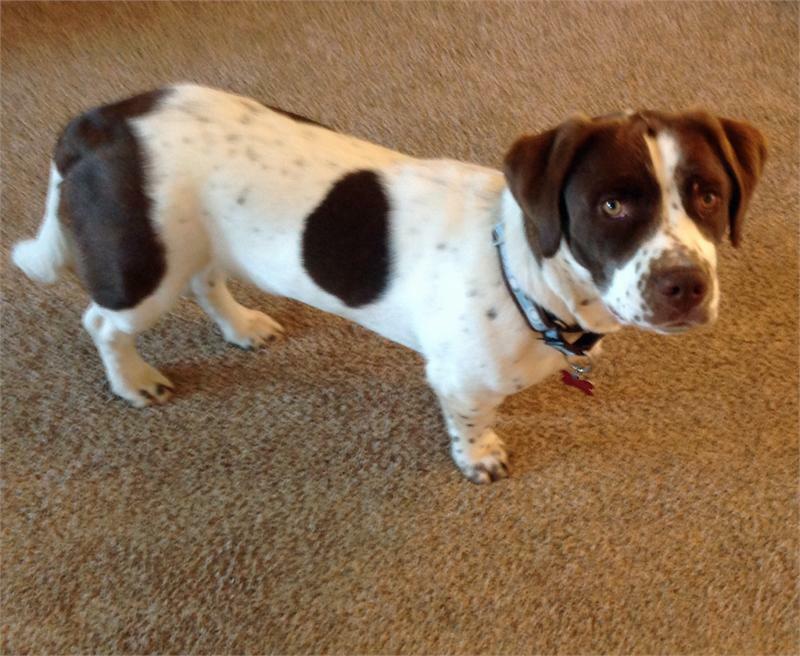 Mickey is looking for a home where he can run and play and expend all of his puppy energy. He will definitely benefit from the obedience training he will get from his new forever family as a MAESSR adoptee under one year old. MAESSR only places puppies in homes that are committed to training and bonding with the pup in obedience classes. Puppies require a lot of care, attention, and patience, and they do chew on things! The decision to get a puppy and raise it to be a healthy, happy, and well-adjusted dog is a serious commitment. To reinforce this commitment, MAESSR requires all adopters of dogs under 1 year old to enroll their puppy in obedience classes within 60 days of adoption. In return, Mickey’s new family can expect tons of unconditional love from this happy fellow who can't wait for his new home.